← Night Run – I’d rather not lose my head and be dissolved in acid. If you have been reading my BLOG then you would remember the entry titled “I Want to Blow My Own Horn” in which I talk about trying to learn to play the bugle so I could join Bugles Across America as a volunteer to play TAPS for those (brothers) that served our nation at their funeral. I’ve always known that I as a veteran am allowed to wear my dress uniform at funerals and I knew what those regulations are for the US Navy Veteran, I didn’t know what they were for the US ARMY Veteran and thought I should look it up. Since I served in both the US NAVY and US ARMY it gives me the flexibility to ware both uniforms, even though I would have to display a lower rank on my US NAVY dress uniform; but ranks not the point right, it’s about honoring a brother solder and his family. One of the questions I had was if I should be wearing the uniforms issued during my service period or if I should be purchasing a set of say… new US ARMY Class A’s? (1) With civilian attire off the installation. (a) Wear only authorized accessories corresponding to those worn by personnel of the AA. I really don’t get it! But I will comply because it’s the right thing to do, not because I agree with it, I did after all serve my country honorably. 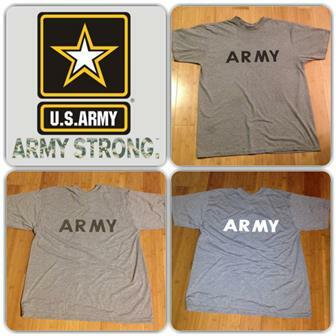 I like to wear my ARMY PFU/IPFU shirts not only because I was proud to have served but because It also motivates me. When I’m in the them I represent the US ARMY and the United States and knowing that keeps me from showing weakness, when I think I can’t run any further the fact that I am the US ARMY in the eyes of people watching helps me push though because I don’t want to have people see me walking when I should be running and viewing the Army in a negative light. Another reason that I like to wear the PT’s is because of all the workout shirts that I have used the US ARMY has the best. It’s just the right weight and thickness; it whisks the sweat better than any workout shirt I’ve ever used. Most of the shirts you can buy at the sporting goods store are the thin things, they work great as tactical undershirts but for workouts just don’t cut it; I’m not in a fashion contest I’m a runner. I have however figured out a way to still wear at least the US ARMY PT shirt, I’m just going to silkscreen VETERAN under the ARMY and it’s no longer a US ARMY PT shirt, it will represent my service and maintain the motivation I get representing the US ARMY as a prior service veteran. In the end I’m glad I found out, what I never want to do is disrespect our military and my bothers in arms. This entry was posted in Military, Running, veteran and tagged ARMY, ARMY PT, Army Regulation 670-1, Improved Physical Fitness Uniform, IPFU, military, PFU, running, US ARMY, Veteran. Bookmark the permalink.